Develop spectacular photos that express your creative vision. Experience native support for RAW files from Canon and Nikon cameras and explore the vast potential of your creativity in PhotoDirector's nondestructive editing environment. Connect with pros on DirectorZone and share and download unlimited presets that will transform your photography. Easily manage large batches of photos and massive photo libraries. Photographers serious about their hobby do it all with PhotoDirector 2011. Photo workflow software designed specifically to smooth the flow from the time an image is imported to your PC to its final output. The best way to spectacular photos. PhotoDirector delivers all the cutting edge tools to retouch and enhance your photos. Target specific areas of your photos with dynamic regional adjustment tools. Adjustment Brushes, Gradient Mask and much more. Explore your creative potential! PhotoDirector is a nondestructive editing environment that inspires your creative flow. Native rendering of RAW files from Canon and Nikon cameras maintains the immaculate quality of your images. Create, share and download unlimited adjustment presets from the passionate DirectorZone.com community. An efficient digital workflow speeds up the entire process from the time an image is imported to your PC to its final output. 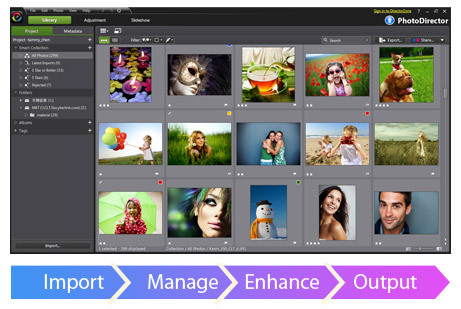 PhotoDirector is designed to make the process ultra efficient from import, manage, enhance to final output. mport your images to PhotoDirector and immediately gain access to a powerful but easy to use library with advanced searching, sorting, tagging and flagging tools for easy management of even large batches of photos. Select the best images you want to enhance from your collection with the help of PhotoDirector’s extensive viewing modes. Choose between the most dynamic adjustment tools and watch as your photos turn into masterpieces. 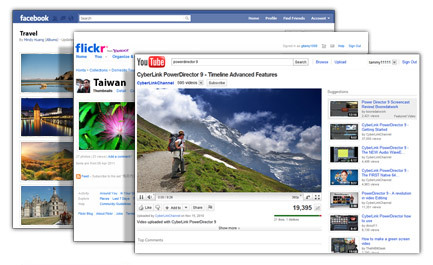 Once you have the perfect look, share you photos to Facebook and Flickr or create stunning HD slideshow videos up to 1080p, and upload them to YouTube. Allow your imagination to explore the bounds of your creativity! PhotoDirector is an advanced nondestructive editing environment, so you can let your creativity run wild knowing your original image is always safely unaltered. Adjust the contrast, exposure or apply adjustment brushes without fear. If you are not satisfied with the effect, you can easily revert back to any revision step with Adjustment History. 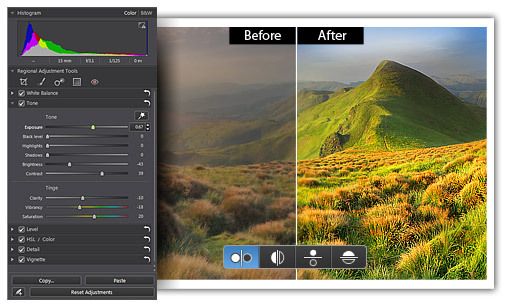 PhotoDirector provides cutting edge adjustment tools which perfect and enhance your photos. Correct the color of your image with PhotoDirector’s advanced White Balance tool, or make the colors in your photo pop by selecting between several color enhancement tools including Levels, Tone and Hue, Saturation and Lightness. If you shoot in high action or low light settings, then PhotoDirector’s Noise Reduction tool is an absolute must have. Bring out all the spectacular image details and make your photos crisp and clear by adjusting the sharpness. PhotoDirector’s dynamic adjustment tools are the best way to incredible images. Some images require precise editing tools for touchups on specially targeted areas. PhotoDirector has you covered with amazing regional adjustment tools that perfect every area of your photo. PhotoDirector’s edge aware brush is the perfect tool for making selective adjustments to targeted areas of your photo. Select the size, softness and amount of the brush you want to apply to a targeted area and touch up the exposure, brightness, contrast and so much more. Select Fit to Edges for super accurate brush strokes, so the adjustment is applied exactly to the area you want to enhance. Explore all of PhotoDirector’s amazing regional adjustments, including Gradient Mask and Spot Removal, and create the perfect image down to the finest of details. When you have hundreds or thousands of photos to choose from, you need flexibility in viewing and comparing different images. PhotoDirector has all of the angles covered, so you can select the best images and the best adjustments every time. Compare multiple images in Lightbox mode or browse through dozens of images in Browser mode. Try List View to see key details of the photo or switch to dual monitor mode so you always have enough screen space. Expand the image to full screen with the pleasure of knowing you still have full control over the adjustments you are applying. Make your adjustments and enjoy several different modes to compare your photo to the original so you know exactly which adjustments create the perfect look. Don't limit your photos by using poor RAW file converters with very basic capabilities. PhotoDirector provides native rendering of RAW file formats from Canon and Nikon cameras, a highly desirable feature that maintains the immaculate quality of your images as intended by the camera manufacturers, without the hassle of installing plug-ins. 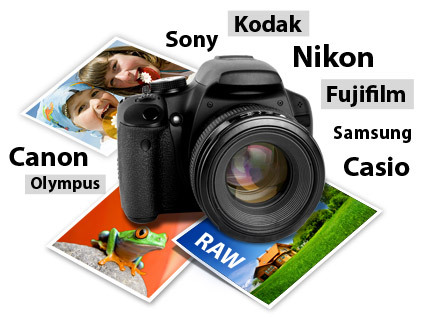 PhotoDirector supports an extensive range of RAW file formats from the world's leading digital cameras. If shooting in RAW is not for you, there is no need to worry. PhotoDirector also supports JPEG and TIFF file formats. With such extensive file format support all you need to worry about is where to take your next photo. Adjustment presets are a great way to perform common touch ups with a single click of the mouse. PhotoDirector comes with a vast array of state of the art presets that turn common or complex adjustments into easy to manage touchups. 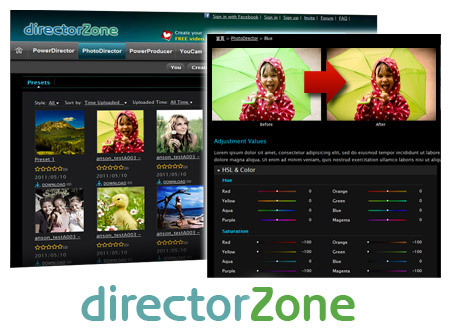 PhotoDirector 2011 is the first photo software that lets users easily share their own presets and download an unlimited number of presets defined by others, directly from the application, through our online community DirectorZone.com. Connect with the DirectorZone community of dedicated PhotoDirector users and share tips and tricks about photography and how to bring out the absolute best of your photos. When you are ready to share your photos, you can upload them to Facebook and Flickr directly from PhotoDirector simply by selecting the share icon in the Library or Adjustment module. Share your collection of photos by creating a crystal clear HD slideshow video, up to 1080p resolution. To reach a larger audience, upload your slideshow videos to YouTube and show the world your passion for photography. PhotoDirector 2011 not only supports JPEG and TIFF, but also supports a broad array of RAW file formats from the world’s leading digital cameras. The lists below represent photos from major camera brands and formats which were tested by CyberLink, however, the list is not comprehensive. If your camera or format is not on the list it may still be compatible with PhotoDirector, so please feel free to download the free trial to test your camera and file formats. 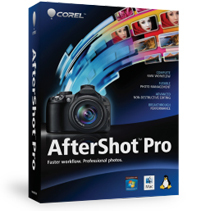 All product of Brand CyberLink Corp.
Corel AfterShot Pro is a fast, flexible workflow solution that combines robust photo management, advanced non-destructive and complete RAW processing. 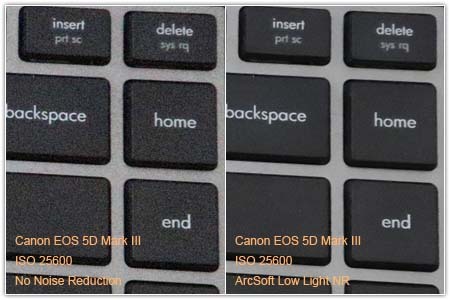 ArcSoft Low Light NR is an innovative image noise reduction application which based on the latest Multiple Frame NR technology (MFNR). Bring photo editing, movie making, DVD/AVCHD? burning, creative projects and easy sharing software together, with one common look and feel that makes your digital experience simple.